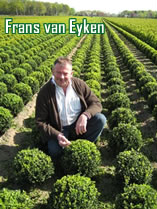 We mainly grow buxus in full ground, whereby we work on the assumption of 3 year old plants or 2 year old cutting cups. 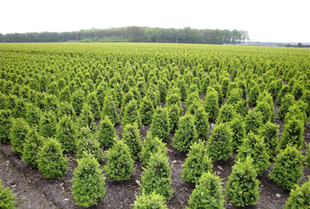 Once these are fully grown and ready for pruning, they are trimmed into their shapes on the field twice a year in order to achieve an even and full buxus. We can be very flexible in this process through carefully reacting to mechanisation developments in the horticultural industry. 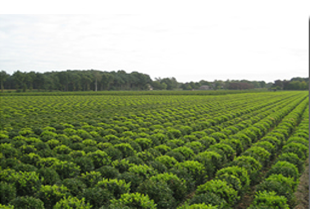 Our plants are selectively dug out from the field, thereby ensuring only good quality products are delivered. The plants are mechanically pruned again before delivery, plus they are manually trimmed to add the finishing touch to a plant which is as even as possible. The plants are also watered and given a colour boost with leaf shine and food. Personal labels and/or stickers can also be secured to the plant in accordance with agreements entered into with the customer.